A pair of Russian TU-160 long-distance bombers have landed in Venezuela, the first time since the Cold War that such plane have touched down in the Western Hemisphere. Two Russian strategic bombers landed in Venezuela on Wednesday as part of military maneuvers, and President Hugo Chavez said he's itching to "fly one of those things." The arrival of the two Tu-160 bombers marks the first time Russian strategic bombers have landed in the Western Hemisphere since the Cold War. The surprise foray into Venezuela was certain to anger Washington and add to the strain in U.S.-Russian relations over Russia's war in Georgia and the U.S. battleships that were deployed to the region. Venezuela is "very interested in strengthening ... our defensive capability with our strategic allies, and Russia is one of them," Chavez said. "This is a redux of Cold War games, and a dangerous thing to do," said Moscow-based military analyst Pavel Felgenhauer. "It will only strengthen the hand of those in the United States who want to punish Russia for its action in Georgia." Chavez called the deployment part of a move toward a "pluri-polar world" — a reference to moving away from U.S. dominance. "The Yankee hegemony is finished," Chavez said in a televised speech. "It's a demonstration of Russia's ability to do things nasty: You send warships to the Black Sea and we send bombers next to your door," said Alexander Konovalov, head of the Moscow-based Institute for Strategic Assessment. "It will have a negative impact on global stability." The Russian Defense Ministry said the bombers flew to Venezuela on a training mission and would conduct training flights over neutral waters in the next few days before returning to Russia, according to a statement carried by Russian news wires. 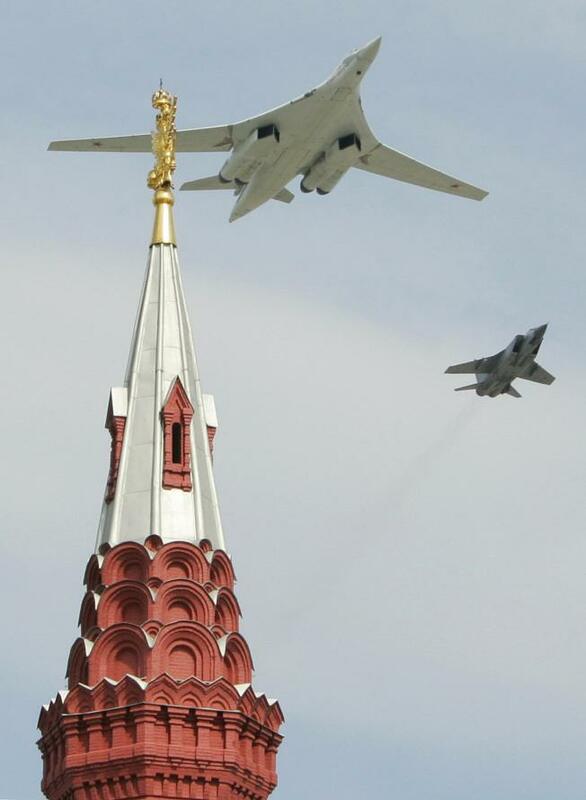 NATO fighters escorted the two Russian bombers on their 13-hour trip to Venezuela over the Arctic and Atlantic Oceans, the Defense Ministry said. Earlier this week, Russia said it will send a naval squadron and long-range patrol planes to Venezuela in November for a joint military exercise in the Caribbean. Meanwhile, NATO said Wednesday it had ended a routine exercise by four naval ships in the Black Sea. Russia had denounced the exercise as part of a Western military buildup sparked by the Georgia conflict. The alliance said the four ships — U.S. frigate USS Taylor and three similar vessels from Spain, Germany and Poland — were moving back to the Mediterranean Sea after the 18-day mission. Chavez has strongly backed Russia's stance in Georgia. He denied that Russia's plans for a deployment later this year are related, saying the Russian navy's visit has been planned for more than a year. Venezuela remains a leading oil supplier to the United States, but as tensions have grown with Washington, Chavez's government has spent billions of dollars on weapons from Russia, including helicopters, Kalashnikov rifles and Sukhoi fighter jets. Chavez also said Venezuela is looking to buy Russian submarines and is working with Russia to set up an air-defense system including long-range radar and "rockets ready to defend the country." The socialist leader, who survived a failed 2002 coup he blames on Washington, repeated his accusations of U.S. attempts to topple him, though he didn't offer specifics. U.S. officials have strenuously denied the accusations. Chavez has also called the U.S. Navy's newly re-established Fourth Fleet a threat. On Wednesday, he said he's sure "nuclear submarines pass under our noses" off Venezuela's coast. He dismissed comparisons to the Cold War, but mentioned Cuba during remarks that he had been reviewing flight theory in a simulator in hopes of flying one of the Russian planes. Addressing his close friend Fidel Castro, Chavez said: "Fidel, I'm going to fly low past there."